This product was added to our database on Thursday 12 January 2017. The BK117 is a twin-turbine helicopter which boasts a spacious cabin, high reliability and an exceptional flight performance. Power comes from two Lycoming turbine engines producing 550 Shp (410 kW) giving a maximum speed 278 km/h (173 mph). 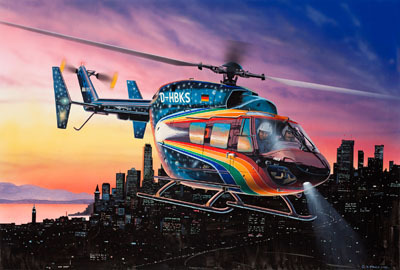 This helicopter with its unique space age livery has been used for demonstration flights over a longer period of time.